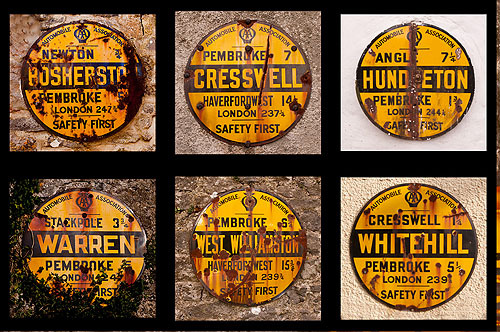 From 1906 to approximately 1922, the Automobile Association erected nearly 30,000 signs in villages and towns across Great Britain. Most were removed during the war when a Nazi invasion seemed highly likely. At the end of World War II, only 600+ were left and today there are around 60+ still in situation around the country. Bosherstons Sign is on a building opposite Bosherston Church. Cresswells sign is adjacent to Cresswell Quay Public House. Hundletons sign is on a building near the B4320 through Hundleton. Warrens 2 signs are on a building near Warren Church. West Williamstons sign is on a building near the easterly road into West Williamston. Whitehills sign is on the low wall of a cottage near the road through Whitehill to Cresswell Quay.